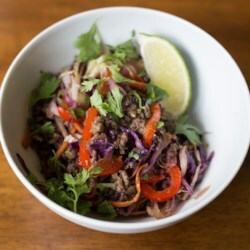 "This meal has it all - beef, shredded veggies, soy sauce, hot sauce, and lots of fresh cilantro. This dish is truly addictive." Heat canola oil in a very large skillet or wok over medium heat. Add garlic and ginger; cook and stir until fragrant, 1 to 2 minutes. Add ground beef; cook and stir until browned and crumbly, 5 to 7 minutes. Push ground beef to 1 side of skillet and add white cabbage, red cabbage, carrots, and red bell pepper. Mix vegetables with the beef and cook, stirring occasionally, until vegetables are just tender, 5 to 6 minutes. Stir soy sauce, sesame oil, and hot sauce into beef-vegetable mixture until well mixed; season with salt and pepper. Serve slaw with fresh cilantro, lime wedge, and more hot sauce.